What do you do with old leftover rice? You know, the stuff that's been in the fridge for over a week and has gone dry and hard. Add water and make congee? But the flavours won't mix as well as rice porridge made from scratch. Turn it into fried rice? If you only have a small amount left over, it's hardly worth the trouble. Arancini? These fried balls are delicious, but ideally made with arborio rice, and you want a good amount of it too. Rice pudding? Great, but you've been meaning to cut back on the sugar. Well, I've just discovered a new use for your old rice, even when there isn't much there—turn it into puffed rice! I didn't come up with this idea spontaneously. In fact, I wasn't even particularly trying to get rid of old rice. How I got onto this project actually started with a discussion about popcorn. Popcorn is made from a type of corn with a hard, waterproof, outer shell and a starchy interior. When heated, the moisture inside wants to turn into steam, and pressure builds up within the hull. The starchy centre gelatinises under the heat and pressure, and turns into an airy foam when the hull finally breaks. 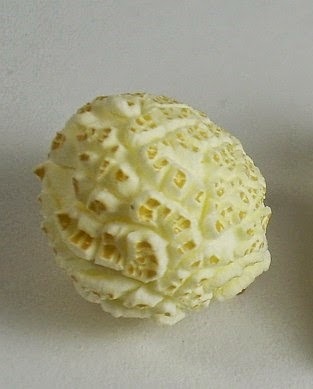 Although most of the popcorn sold in New Zealand is in the snowflake-like "butterfly" shape, we came across the other commercial variety with round "mushroom" shaped kernels while in Korea. It seems these are two different varieties of popcorn, so I was surprised to read that the kernels from a single cob of popcorn may form both butterfly and mushroom flakes. I tried to discuss these popcorn varieties with my Korean friends, and they had no idea what I was talking about. They insisted the popcorn in Korea is just like here. Finally, we worked out what the problem was: while we would call both types "popcorn" in English, in Korean the word pabkon (팝콘) refers to the butterfly version only. 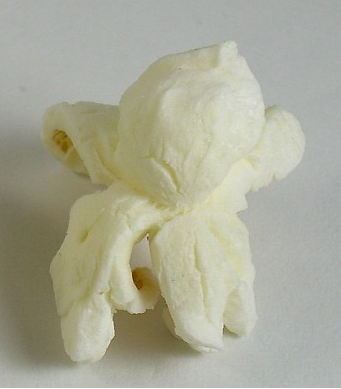 The round popcorn is known as gangnaengi (강냉이), which also seems to be the North Korean word for "corn". If you can read Korean, you might like to check out this science project comparing the two popcorn varieties. While I have tried making butterfly popcorn at home, I couldn't be bothered looking for mushroom kernels for me to play with. Plus, with the higher temperatures needed, it sounded like it would be impossible to cook them with butter without burning. Instead, I thought about what else could be expanded into a delicious snack. Apparently, many grains can be puffed, from amaranth to barley to oats to wheat. What I had on hand at home, however, was rice. Unlike popcorn, rice doesn't come with a hard, waterproof husk to hold the moisture in and build up pressure. Raw rice you purchase from the shops also does not have enough moisture. If you attempted to heat rice the same way you do popcorn, chances are you will end up with burnt rice. I was totally amazed by the videos I found of puffed rice makers in India. From what I could see, skilled workers threw unmilled rice into a wok-shaped cooking pot filled with hot sand, and stirred until the grains puff from the heat. They scooped the contents out of the pot, shaking the sand out through a sieve, and that was pretty much it! They make it look so easy! Sanjeev Kumar says the rice is cooked over low heat in iron kadais, but the temperature can't be that low, as the rice puffs in just a couple of seconds. There also seem to be variations as to how the rice is expanded: some say raw rice is used, completely dried in the husk, sometimes mixed with oil; others say the rice is soaked in salt water first, then either drained or dried. In one video, it looked like the rice was soaked and cooked first, with steam rising from the covered mounds. Other ingredients may also be added to make a delicious street snack. If you know the Odia language, perhaps you can translate what they are saying in this video filmed in the Tangar Pada village? In the state of Odisha (formerly known as Orissa), where this was filmed, and in particularly in the district of Mayurbhanj, puffed rice is apparently such a significant part of the diet that Geographical Indications (GI) registration was sought. In Assam, they have a specialty called hurum, which is made from glutinous rice. Waxy (glutinous or sticky) rice, known as bora, e.g. "Paddy is first softened in water and subsequently steamed and heated. After the frying process, paddy is broken down by dheki, to separate rice from paddy. Thereafter, it is heated again with sand to get the crunchy product. The finished hurum is immediately sealed in polythene packs to avoid moisture from damaging it"
Obviously, apart from making puffed rice from traditional methods, there are also factories that produce this. Sadly, some have been caught burning tyres for fuel, damaging the health of people in the community, as well as the environment. From the videos I found of puffed rice making in Vietnam, the process used is very similar to that in India. Although everyone filming seemed to be part of a tour group in the Mekong Delta (with commentary available even in foreign languages such as German), the puffed rice producers also work with unmilled rice, and heat it in a wok-shaped cooking vessel with hot sand. The main differences seem to be the use of sticky rice, a larger pan (presumably as this is part of a commercial operation at a candy factory), and the rice is put into sieves hung from the ceiling: first to remove the sand, then to remove the husks from the puffed rice. One video showed the puffed rice being mixed into caramel and cut into squares for packaging as a sweet snack. According to Echoes from Old China, the Hakka people are famous for the puffed rice cakes, made by steaming glutinous rice, drying it in the sun, and puffing it in hot sand, to make puffed rice cakes for New Year. This treat has also been taken to Hawaii. However, most videos I encountered online showed the use of an old-fashioned pressure cooker, which makes for a spectacular show. I have seen pictures from 1938 of the Chinese use of a metal "popcorn hammer" or "popcorn cannon" to make popcorn, and some say this may have been invented in the Song Dynasty (960–1279) for puffing rice. The grains are placed in cast-iron cylinder, which is sealed, then turned over a flame to prevent the contents from burning. Pressure builds up inside, and when a certain level is reached, the container is opened with a loud bang, and the puffed cereal spills out into a prepared bag. This method of popping rice is also used elsewhere in the world, including in Taiwan, in Japan, and in Korea. There was also a video which seemed different from the rest, in that it looked like the rice was puffed directly in molten sugar, rather than being puffed first before being added. Despite popcorn and puffed rice having been made in Asia for centuries, Alexander P. Anderson is often credited as the inventor of the process for making puffed cereals such as puffed rice, which was introduced to the American public in 1904. It wasn't until 1913, however, when the product was marketed as "the cereal shot from guns", that sales really took off. The problem with original gun-puffing process was that the cereals had to be popped in batches. In the 1960s, a continuous puffing gun was created, which increased output. Another commercial process, oven puffing, is described in a patent issued to Kellogg. Last year, Cornell University announced a new method of making puffed rice by supercritical fluid extrusion. So... I don't have commercial equipment, a small puffing machine, or a fiery pit to work with sand. I decided to go with the frying method instead. Despite a blogger saying you can puff rice with only 1 tsp oil, it seemed safer to deep-fry, since I have actually seen videos of this working. I am also keen to see if using salt instead of sand would work, though I am not sure if my wok would be able to withstand the heat, and would rather see someone else try it first. I used jasmine rice, as that was what I had at home, and tried several different methods: frying raw rice, soaked rice, cooked rice, and dried cooked rice. I can tell you right now, dropping raw rice in hot oil isn't going to work. There is not enough moisture in the grains for the starch to expand. Even after leaving the rice in for much longer than any of the other trials, nothing seemed to happen. Raw rice before (left) and after frying (right). If lack of moisture is the problem, it only seemed natural to try soaking the rice in water first. I had the rice soaking for several days so the water could hopefully work its way to the middle of each grain. Unfortunately, I did not give time for the outside to dry, so it splattered when it hit the oil. Still, the grains did expand a little, and became translucent with frying. The end result was quite hard though. Soaked rice before (left) and after frying (right). Cooked rice is nice and soft, and is expanded somewhat already. This batch was sitting in the refrigerator (in an enclosed box) for a couple of weeks or so too, so it was not too wet. The grains puffed a bit on frying, but stuck together in a clump. Cooked rice before (left) and after frying (right). Dried cooked rice is what most people recommend using, and this gave by far the best result out of the variants that I tried. I left the it out for around two weeks, so it looked translucent, shrunken and cracked. It only took a few seconds to puff in the hot oil, and each piece remained distinct, rather than sticking together. Dried cooked rice before (left) and after frying (right). Dried cooked rice before frying. I made the best puffed rice by frying dried cooked rice in hot oil. This was crispy and delicious, though it also sometimes left some chewy bits stuck to your teeth. You'll need to turn it out onto paper towels to remove as much of the oil as possible. My puffed rice was quite different from the rice bubbles you can buy in the supermarket, which are mixed with sugar, salt, barley malt extract, and added vitamins and minerals. My homemade puffed rice (left) and Sanitarium Ricies (right). I'd like to try some other methods of making puffed rice, but I was quite pleased with the results as they were! This post is part of Our Growing Edge, a monthly blogging event aimed at inspiring us to try new things. This month, it is hosted by Phuong from My Kitchen of Love. This is awesome! I bought some puffed rice on the weekend and wondered how it was made. Might try this myself at home! How I made puffed rice is definitely not how they would have made it in a commercial setting, but yes, it's amazing how much the dried grains of rice puff up in the heat. What a thorough post! I feel like I know more about puffed rice than I ever intended. I used to eat rice bubbles as a kid but I never made the connection that they were actually made from rice. The flavour is so different. Did your puffed rice (the dried cooked one) taste like rice? Thanks for sharing your experiments with Our Growing Edge this month. The post was going to be even longer, but I ran out of time. I would really like to find some more definitive info on when puffed rice began to be made in Asia, and how they got to the idea. My puffed rice tasted vaguely like the dried up crusty bits you can get at the bottom of your pot of rice, but with an oily undertone. I wonder,can I put sugar, salt, and barley malt extract to the homemade puffed rice? I haven't tried doing it, but I would be interested in what the result is for you! Would you need to cook the rice in the flavoured water or soak the cooked rice in it. These ingredients are in commercial puffed rice because they don't use whole grain of rice. If i first cook the rice in flavoured broth, dry it then fry it, would it still taste something of the flavoured broth at the end? great post btw! I guess it's worth trying, but I don't know the answer, sorry. Please let me know how it goes if you do try it! Well research, thanks! Do you think this can be used as rice crispies in chocolate, eg. homemade bars! You can taste a bit of the oil in my puffed rice, unlike the ones made without frying in oil. Each grain was also smaller in size than the bought ones. If you don't mind the differences, it should work. I think the flavour would be more suited to a savoury bar, like the Vietnamese rice crackers, but I imagine it would go with chocolate too. Absolutely! For instance, here is someone making Vietnamese crispy rice crackers by spreading the cooked rice out in a sheet, baking it to dry it, then frying the pieces. veRy nice to see , even people without tooth can enjoy the puffed rice..for its taste and soft nature and it is also easily digestable. Thank you so much for such an informative, well-researched and well-written article. I put some oil in my wok and then put a Thai jasmine red/brown mixture in a strainer and put the strainer in the oil. The red rice looks like american brown rice, and the brown rice looks like our wild rice. I had the oil at about 400 degrees F. It took the rice just a few seconds to pop, and the brown (or wild-looking rice) did it beautifully. It actually came out looking a lot like miniature popcorn. I am going to get some regular american wild rice and see what happens -- I liked saving the cooking/drying step of regular rice. Cool, I'd love to see some pictures of this! Hey, this is a beautiful post. Thanks for sharing what did not work ;) Can we skip the oil and still get a crispy puffed rice? The puffed rice makers in India and Vietnam used hot sand instead of oil, but I haven't tried this. HI, this post is very educational esp for us south indians living in the USA and yearing for traditional NEL PORI. Can you also post how they make aval (poha) pori? The Tamil Nadu Agricultural University describes the process: "Paddy is soaked in water for 2 -3 days to soften the kernel followed by boiling water for a few minutes and the water is drained off. The paddy is heated in a shallow earthen vessel or sand in iron pan till the husks break open. It is pounded by a wooden pestle which flattens the kernel and removes the husk. The husk is separated by winnowing. Flaked rice is thin and papery and of white colour." As to how the rice flakes are puffed, I have not found much info, but an FAO page says "Flaked or beaten brown rice and parboiled milled rice may be converted to puffed rice by heating in hot air or roasting in hot sand (Juliano and Sakurai, 1985; Villareal and Juliano, 1987)"
Hi, I haven't tried this, but I would say that the rice cannon is different because it provides not just heat, but also pressure which is instantaneously released. A popcorn maker could potentially work with particular kinds of rice which have a hard husk like popcorn, but not standard white rice, I'd say. Impressive and informative inquiry. Thank You. This reminds me of my almost lifelong quest for how to make a childhood treat from the Philippines called Lao Hua. Quite popular too as Ma Lao in Taiwan and as it turned out, also as a traditional Korean accompaniment to tea called Kugwa. Thanks for sharing (and sorry for the slow reply). I couldn't find much online about Lao Hua, though I came across lots of search results for 麻粩 (ma lao in Taiwan) and 유과 (yugwa in Korea). Do you have any pictures or further info? In South India, we make wafers(Vadam in Tamil language) out of rice using rice flour cooked in boiling water along with salt and green chilli paste. We have a mold for squeezing out the dough it various patterns on a clean plastic sheet or cloth. It is then dried in the sun. When completely dry, it is fried in hot oil and enjoyed as it is or as accompaniments to rice and gravy. These dried wafers have a long shelf life if stored in air-tight containers and if protected from moisture. Typically it is a yearly ritual for ladies in South indian households, undertaken during the summer season. That sounds like a delicious use for leftover rice - thanks for the info! Thx for a well-researched and interesting post. I wonder if using commercial parboiled rice would eliminate the first steps. Maybe even putting it straight into a popcorn popper? I would really like to find a non-deep fry recipe. The cooking in hot sand is ingenious, but not practical for where I am. Interesting thought about commercial parboiled rice - let me know the results if you do try it! As per my previous comment to Scholastic Appster, I don't think it would work with a popcorn machine, but I would love to be able to puff rice without oil or sand too! Oh yeah, looks like someone has already tried using a popper and failed. Hi, I came across your post whilst looking for information on puffed rice, particularly using sand. Very very informative post. Thanks for taking the time to research and write about it. I live in a western country and am really interested in trying the sand method but not really sure what type of sand it is they use and where could get that? Also, do you know of any health safety issues with using sand for cooking like this? I read somewhere about lung cancer/silicosis potentially being an issue and wondered about it? Am very much struck with how effective, efficient, easy and fast the sand method is/looks but haven't really seen it being used in western countries but seems it's quite extensively used in the Asian countries and wondering why? I'm afraid I am not an expert on cooking with sand, or any health impacts it may have! Do let me know if you find out more on the subject though. Actually, it’s not sand it’s salt that became brownish because of heating. It gives a good taste. I ate that kind of puffed rice many times in Bodhgaya India. I realise that this is an older post, but I was surprised at what you said about leaving cooked rice out for weeks. Rice is one of the foods that can be very risky if it is reheated because of the likelihood of Bacillus cereus spores in the uncooked rice not being killed during cooking. It can give you food poisoning. The recommendation is that you don't keep cooked rice for more than a day or so in the refrigerator. I was looking for ideas on puffing my own rice and came across this. Your method looks fine - but that standing period for cooked rice is really risky. I was surprised at the length of time you kept cooked rice for before trying this. Reheating cooked rice is risky because of Bacillus cereus spores possibly surviving the cooking process. These can give you food poisoning. All health advice suggests not keeping cooked rice for more than a day or so in the refrigerator, and I've seen it growing black mould/mold in under a week before now. And it is the toxins produced which do the harm - not the bacterium itself - so further cooking wouldn't necessarily eliminate the risk. Might be worth warning people just in case. Oh, interesting. I definitely keep cooked rice in the fridge for more than a day rather frequently, though I guess 2 weeks is a bit extreme. Thanks for the info - I'll let people do their own research and weigh up the risks. Hey there! This is really old but I just tried making some puffed rice and it went really well. We're just waiting and hoping all the oil drains out so it's not adding some extra umhealthiness. So we used cooked then dried rice to do it, and then we tried some uncooked rice to see what the difference would be and guess what! The uncooked rice actually popped like popcorn! I thought that was interesting. But I think only about a third of them popped.